We’re here to help you with all the boring, adminny, practical and unfortunately very necessary parts of your wedding, which is why we’ve developed super powerful wedding planning tools, alongside our amazing venue directory. But on top of that we totally want to help with the frillier, more exciting bits too! 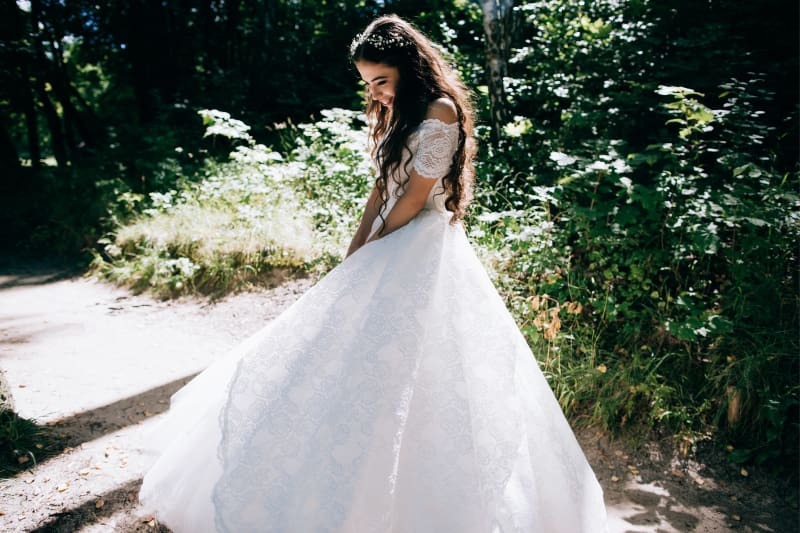 Choosing your dress is definitely one of the most exciting parts of being engaged, so grab the bubbles, some of your nearest and dearest and hit the shops! 1. Give yourself plenty of time. It can take around 6 months to make a wedding dress, so give yourself lots of time to enjoy all the appointments and fittings. 2. Research away. Working out what you like and don’t like is the first step, so make a few appointments. Then you will know you’ve found the perfect dress – gold star for you. 3. Who to bring? Part of you wants to bring a gaggle of friends to drink bubbly and try on a bunch of dresses, but that’s all well and good until you have seven opinions for every dress. Many boutiques stipulate a maximum number of accompanying guests, which is usually 3 or less. Take a couple of people who’s honest opinion you trust and who’s company you enjoy. 4. Be Prepared. Some stores ask you come without makeup or perfume on for fittings, so check before. Neutral coloured, seamless underwear works best when trying on dresses – or rock out the fluorescent pink if that’s your vibe. 5. Budget. Be realistic about what you can afford when shopping for your wedding dress. Add in the extras: veil, accessories and shoes. If you’ve put in your budget with Bridebook (if you haven’t, get on it now! ), we’ll have given you an estimate for that bit of your spendings. 6. Wedding lingerie. If you’ve chosen a dress that leaves you wanting some extra support, choose some practical underwear for the day that can lift and hide whatever you want hiding. Save something sexier for the wedding night. 7. Think through the storage and transportation. Think about where your dress will be stored pre-wedding and how it will be transported to the wedding location. Wedding dresses can require a lot of space (and believe it or not, you can buy your dress a seat on a plane)! 8. Get it in writing. Make sure you have all the details (whether given to you in the store or sent via email) such as: when your dress is due for delivery and the dates of your fittings in writing. 9. Dry cleaning. Budget in the dry cleaning of the dress post-wedding. It will often cost a lot more than you expect.